Sarah Wilner is the Laurier Brand Chair. She holds a PhD in Marketing (minor in Product Design) from York University, an MBA in Marketing from the State University of New York-Buffalo, a post-baccalaureate in communication studies from Bentley University and an undergraduate degree in cultural anthropology from Brandeis University (minors in Sociolinguistics and Women's Studies). 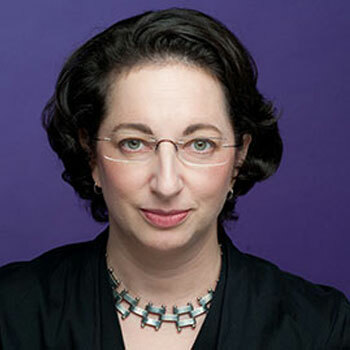 Wilner is also a seasoned manager, having managed marketing and communications in a number of public sector organizations, as well as leading several as executive director. ﻿“Making Mainstream Markets: The Role Product Design in the Process of Legitimation,” with Aimee Huff (Oregon State University) and Ashlee Humphreys (Northwestern University). Invited for revision and resubmission at Journal of Marketing. The study examines the role of product design in the emerging recreational cannabis industry in order to understand the role of materials, metaphors and subsequent meaning in a previously stigmatized product category. "Towards a Definition of Design Thinking," with Pietro Micheli (Warwick University) and Michael Beverland (RMIT). Invited for revision and resubmission at ﻿Journal of Product Innovation Management.﻿ We examine the literature on design thinking in management, reveal tensions in the term's construction and use, and develop a grounded, relevant definition that provides guidance for future investigation. “What Lies Underneath: How Marketing Capabilities and Their Microfoundations Shape Innovation Success” with Nicole Coviello and Anne Dormuth. “Speaking from Experience: Mining Social Media Text for Consumers’ Responses to Experiential Marketing” with Greg Tanguay and Asfiya Taji (doctoral students). In 2017, Dr. Wilner was named the Laurier Brand Chair. She is the recipient of the Innovation Award at the Lazaridis School of Business and Economics (2016) and an Insight Development Grant from Social Sciences and Humanities Research Council of Canada (2016-2018). Wilner is also a three-time recipient of the Ontario Graduate Scholarship and was awarded a Fellowship from the Social Sciences and Humanities Research Council of Canada in 2009. She was named the Canadian Federation of University Women's Beverley Jackson Fellow in 2010-2011 and an M&T Bank Fellow from 2000-2002. In addition, she has received merit-based awards from York University, State University of New York at Buffalo's School of Management and Brandeis University and was elected to Phi Beta Kappa in 1988. I welcome supervisory inquiries from graduate students interested in my areas of expertise. Please note that I will only supervise research employing qualitative research methods (although I sit on multiple doctoral committees which employ mixed methods and/or are concerned with topics related to my research). Wilner, Sarah JS and Aysar Ghassan (2017), “Tales of Seduction and Intrigue: Design as Narrative Agent of Brand Revitalization.” Journal of Marketing Management. Special Issue: Design, Consumption and Marketing. Forthcoming: DOI: 10.1080/0267257X.2016.1271346. Kozinets, Robert, DeValk, Kristine, Wojnicki, Andrea and Sarah JS Wilner﻿ (2010), “Networked Narratives: Understanding Word-of-Mouth Marketing in Online Communities,” Journal of Marketing, 74(2), 71-89. Dr. Wilner's research papers have been presented at Association for Consumer Research Conferences, the American Marketing Association Winter Educator's Conference, European Association of Consumer Research Conferences, the Product Development Management Association's Research Forum; the International Society for Product Innovation Management; Consumer Culture Theory Conferences and Ethnographic Praxis in Industry Conference meetings, among other scholarly venues. Qualitative Methods (BU818) and Individual Research (BU802) (PhD program at Wilfrid Laurier University). New Product Development (MKTG 6440, York University). Marketing in the Non-Profit Sector (continuing education at the University of Toronto).